I can do a lot in 30 minutes. ♦ I can vacuum my whole house. ♦ I can watch my favorite tv show. ♦ I can run nearly 4 miles. ♦ I can read through facebook, twitter and many blogs! I’m going to show you how taking 30 minutes at the beginning of your week will help set the tone for the rest of the week. I mentioned this in my healthy eating and exercising tips, but we are going to dive into it a bit more. By planning and preparing for the week, you’ll eliminate some hiccups that will come in your week. One week of bad habits is enough for some people to throw in the towel and give up. Let’s try to be proactive and avoid them as much as possible!!! Pick a Saturday or Sunday and get 30 minutes with no interruption (I’ve lost you, haven’t I?! LOL) I prefer a weekend because it truly is right before we START our weeks! (When I mention plastic baggies below, you can also use the smaller reusable plastic containers) Here are some things you can do to make your week work! ♦ Boil some eggs. Hard-boiled eggs are a great source of protein and when you are hungry and need something quick, it’s a perfect snack. Make them ahead of time, peel them and put them in their own small baggies so you can grab and go. ♦ Prepare your fresh foods. If you’ve gone grocery shopping and have chosen fresh strawberries, peppers, grapes, broccoli or cucumbers for instance, then they need washed and cut up. Take some time to clean and cut. How many times has your fresh food gone bad because you’ve not had time to clean and cut them? GUILTY! ♦ Portion your fresh foods. If you pack your lunch, go ahead and divvy out your veggies into baggies. If you are a mom on the run, make many small bags with the fresh food in them. That way you can grab and go. Sometimes I’ll put a short clear glass of water in the fridge and stick slices of peppers or celery in them for a quick grab and go. ♦ Portion your nuts or healthy snack mix. We all know that we can’t be eating handfuls of nuts, so take the time out and portion them out into baggies. Again. Grab and go. ♦ Take a glance at your calendar. Have a Parent Teacher conference this week that coincides with your workout? Need to cut short your morning strength class because you have to take Johnny to the dentist? Be aware of the obstacles that will come into your schedule for the week, then find a way to re-work it. The re-work may not happen, but it’s worth a shot. Don’t just skip a workout because something comes up. Try to reschedule it or do a smaller version. Remember that objects in motion stay in motion! 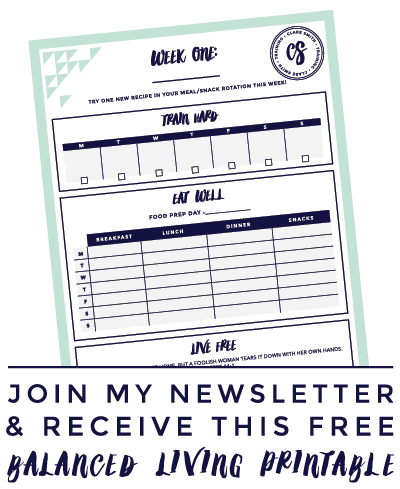 ♦ Review your menu (if you make one) for the week. Take into consideration the calendar above. Make adjustments as needed so you aren’t spending unnecessary money and eating empty calories at fast-food joints. ♦ Take a chance to pray for the week. Pray for your kids, your husband and for your home. There will be a lot of things thrown at you and your family this week. Take a deep breath and commit the week to the Lord and ask for His protection and wisdom! Think of the calories you’ll save by grabbing some fresh peppers instead of a bag of chips! Think of the calories you’ll burn by moving your Tuesday morning pilates to a mini Tuesday evening session instead of skipping it! Think of the money you’ll save by using food you already purchased for snacks instead of buying them in a vending machine! I guarantee you if you take the time out to do these things, that you will make great advancements in your health. You will be prepared for the curve balls life throws you and instead of dodging them, you’ll face them head on with victory! What are some foods that you like to prepare for “grab and go” instances? If you have a recipe, please share! Great tips girl! I love the idea of getting organized on the weekend with portioning snacks in baggies! I NEED to do this! I love these tips – I need to get in the habit again of taking time on the weekends to prepare my food for the week. I used to prepare all of the salad fixings (cut tomatos, celery, peppers, etc) and put them all on a tray in the fridge. It makes preparing a salad for lunch a breeze! i usually do this with my fresh veggies when i get home from the grocery store (at least within a day). its helps a TON! i also benefit from having my weekly list, menu, plans…done by monday morning. goes for a much better week for sure!! great tips! thanks for encouraging us all! Clare, thank you for sharing your tips with us, letting us print or save to a PDF! I found you through the 65 day challenge and I look forward to following your blog/tips. I am new to the blog challenge world and I am not familiar with all the linking and stuff but I’m trying to learn it all. Have a fantastic Wednesday! Hey Clare! Just found your blog-thank you for taking the time do put this together 🙂 I like this article-it’s a good reminder for me to get my healthy foods prepped before the week starts so I have no excuses later 🙂 Also, freezing veggies and fruits after washing/cutting them works best for me. I find that peppers and onions are a pain to cut up but to have them ready to go is great. Frozen fruit is good to toss into a blender for smoothies. :)Thank you again! Clare, I LOVE your blog!!! One little thing I do the night before working a 12 hr shift is make a smoothie with every kind of fruit I have in the house, spinach( because you can’t taste it in a smoothie, yogurt( I’ll have to try Greek)) and dates for sweetness. I drink a cup every time I feel hungry throughout the day and it sustains me til I get a real break to really eat. LOVE this idea! We are a big smoothie house too. Great way to get rid of random foods and what a healthy alternative! Great point on how it sustains you through the day for a quick fix!! Thanks for stopping by, Summer! I boil eggs, grill chicken, wash and cut fresh veggies. LOVE, LOVE, LOVE THIS!!!! Thanks so much for sharing all this great info! I have always been a chip eater but I love the peppers in a glass of water! This is really going to help me this week!! I haven’t met ya in person but love you like a Sister!! Thanks!!! New to your blog and I absolutely LOVE these tips!! !